Winning over Philly sports fans is no holiday. But with his rocket arm and a 10-1 start, Carson Wentz has given Eagles faithful something to be thankful for. Winning over Philly sports fans is no holiday. But with his rocket arm and a 9-1 start, Carson Wentz has given Eagles faithful something to be thankful for. A version of this story appears in ESPN The Magazine's Dec. 7 Thanksgiving issue. Subscribe today! On a Tuesday morning in early November, three men -- one in his 20s, another in his 30s and the third balding and middle-aged -- wait their turn at the Wawa on Ridge Avenue in Roxborough, a small slice of northwest Philadelphia. Like a lot of locals, they've come to get their day started at this eastern Pennsylvania institution, loading up on coffee and doughnuts and perhaps a breakfast Sizzli or two. As they inch their way forward to pay for their goods, they make small talk, growing animated, a little breathless. These men, who didn't arrive together, don't work together or know one another at all, are downright giddy. All three are wearing No. 11 jerseys. The Eagles, fresh off a 51-23 mauling of the Broncos, are on a bye this week. There's no game day on the horizon. And Carson Wentz, the quarterback whom the trio has chosen to pay tribute to on this otherwise unremarkable fall Tuesday, is hundreds of miles away -- off hunting in the country, taking a breather from his team's intoxicating, unanticipated 8-1 start. Behind them in line, a 71-year-old man in a blue button-down and blazer looks on in bemusement. "I feel underdressed," he jokes half-heartedly to himself. He keeps a close watch on the Eagles too -- has since Sonny Jurgensen's rookie year in 1957 -- but does so now as the team's unofficial historian. Ray Didinger was inducted into the Pro Football Hall of Fame back in 1995 for his years spent covering the NFL as a reporter for the old Philadelphia Bulletin and Daily News; now he co-hosts a show on the local sports radio station and rehashes Eagles wins and losses on TV. The Wawa cashier, Marilyn, knows Didinger and what he does for a living, so after the three Wentzes pay and take off, she rings up Didinger's 32-ounce Diet Coke and newspapers and looks up. "They're going to break our hearts again this year, aren't they?" The Eagles' front office and coaching staff explain why they moved up to make North Dakota State QB Carson Wentz their franchise quarterback in the 2016 NFL draft. Here is where Carson Wentz, the 24-year-old North Dakotan who's 26 games into his NFL career, has left Philadelphia: on the precipice between fatalism and fervor. This town is teetering. The first quiver came 18 months ago. The Eagles introduced Wentz to Philadelphia on April 29, 2016, one day after plucking the North Dakota State product with the second overall pick in the draft, and unfurled his No. 11 in midnight green. At the sight of it, Didinger stopped cold. "The first thing I thought of was the fact that the Eagles have won the NFL championship just three times in their history," he says. "And each time they won it, the quarterback wore No. 11." In 1948 and 1949, Tommy Thompson; in 1960, Norm Van Brocklin. Wentz wore No. 11 in Fargo too, so preserving his old number with his new team shouldn't really have sent shock waves via symbolism. But after a string of false messiahs and near misses, fans in this city have been waiting. They've been searching for someone to pin their hopes on, who wants those hopes pinned on him in return. Now, a year and a half later, they're willing to believe they've found him. Or perhaps the 35 percent uptick in Pennsylvanian baby boys named Carson in 2016 is coincidence. At the epicenter of this fever pitch is Wentz, who is doing his level best to preserve calm. Outside his locker after a recent practice, he maintains obliviousness to any growing fervor. "Honestly, at least for me," he says, "win, lose, draw, good, bad, ugly -- I don't really think about the outside noise." No one tell Wentz, but his resolve to tune out the roar, to put on his hard hat and go to work, might just stoke these particular masses. Blue-collar ethos is a crowd-pleaser everywhere but especially in Philadelphia. "He seems like a guy that could be living in a row house in Kensington," Didinger says. Less than two years in, his teammates' inventories of Wentz-inspired folklore are already fully stocked. Tight end Trey Burton remembers watching Wentz play through a fractured rib last August. Fellow tight end Brent Celek raves about Wentz's red zone run against Carolina this season and the way he just ran full-bore into a defender. Lord, do they love that here. They eat it up. And then throw in some wins? Mayhem. In defense of said mayhem, consider: Everything that this town believes, everything it wants to believe about Wentz, is buttressed by ample evidence. Through his first nine games this season, besides steering the Eagles to the league's best record, Wentz had thrown 23 touchdown passes. That's more than any other Eagle has rung up to start a season in franchise history and third only to Dan Marino and Kurt Warner among all quarterbacks in the first nine games of their first or second year. Last fall, long before the team's hot start to this season, the NFL Network's Brian Baldinger declared Wentz to be "Peyton Manning pre-snap and Aaron Rodgers post-snap." And it's true that at least once a game he'll thunder "Kill, Kill" at the line, evoking Manning's "Omaha," or extend a play to laser a pinpoint throw into a shrinking window to his receiver, conjuring Rodgers' wizardry. Through Week 11, Wentz boasted the NFL's third-best TD-to-INT ratio, behind Tom Brady and Alex Smith. His QBR (70.9) was fourth best, his yards per attempt (7.6) was ninth, and his third-down completion percentage (64.8) ranked sixth. Mike Giddings, president of Proscout Inc. and consultant to up to 15 NFL teams at any given time, uses a color-coded system to evaluate talent -- blue in Proscout parlance connotes star or superstar ability. As he skims through his notes on Wentz at the midseason mark, a theme develops: "Big plays, blue. Buying a second chance, blue. Speed, blue. Hanging in the pocket, blue." In all, Giddings finds that among the 23 traits he analyzes in quarterbacks, Wentz rates blue in 12 of them. Only two passers in the league claim more. "Oh my," he says, tallying them up. "He's top three. He's in there with Tom Brady and Drew Brees right now." Everyone and everything -- stats, experts, talking heads -- tell hopeful Philadelphia fans the same story: This is real. Wentz's coaches and teammates will assure you that the quarterback's rapid ascension is no accident. It is born, they say, out of a willingness to slog. To study. To meticulously catalog those studies. To debate his coaches on the merits of those studies. Back at North Dakota State, where Wentz led the Bison to FCS national championships in 2014 and 2015, his coaches dissected the team's third downs on Tuesdays. In the meeting room, their discussions started promptly at 6 a.m. By 6:30, Tim Polasek, then the offensive coordinator in Fargo, would have multiple text messages. Wentz, first thing every Tuesday morning, plied his coach with third-down suggestions. Polasek would consider Wentz's offerings, then look at the board full of plays the staff had cooked up. "Jeez," he'd say. "Let's erase that idea. This one's better." As a pro, Wentz still engages in those debates. At home against Washington in late October, the Eagles installed a play at Wentz's behest that came straight from his old college playbook -- a two-tight-end package that culminated in a touchdown pass to running back Corey Clement. He even called NDSU to secure old film, evidence to convince the Eagles brass that the play could work. "The way I trust Carson right now is because of the way he studies and prepares," Eagles coach Doug Pederson says. "If he were just coming to me with out-of-the-blue ... just pulling things from the air, it would be a little different. But I know when he comes to me, it's well-thought-out." Later that same Monday night against Washington, just five seconds into the fourth quarter, Wentz lined up in the shotgun on third-and-8. Six Redskins descended on Wentz's pocket, where he was swallowed whole and a sack felt inevitable. 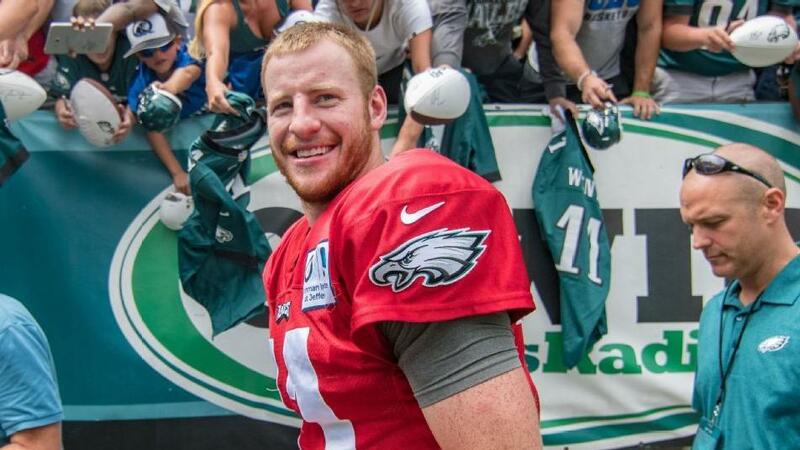 "Wentz will be ... escaping!" screamed Monday Night Football play-by-play man Sean McDonough. As Wentz fled from the pile of bodies that McDonough, Washington's rushers and all of Philadelphia thought had engulfed him, Eagles quarterbacks coach John DeFilippo, who had been planning for the next series, looked up from his call sheet. "All of a sudden I hear the crowd go crazy," he says. "And out he goes." Wentz would scramble for 17 yards and a first down, just one more play in a growing stockpile that has delivered this team and its fans from a familiar feeling: disappointment. "Even if he wins a couple of Super Bowls along the way," Didinger says, "when people are just kicking back in some bar in Fishtown, talking about Carson Wentz, it won't take very long before somebody says, 'But you know what play I remember the best? That play against the Redskins.'" Randall Cunningham is known around these parts as an Eagles legend, but when he talks about Wentz, he sounds more like the pastor he has become in his post-playing days. The young Eagles quarterback, he says, "is in a divine place at a divine time." Therein lies the nagging twinge of trepidation in Philadelphia's Wentz-infused mania. These fans have felt sure they had the divine person in the divine place at the divine time before. Once upon a time, there was a second-year star who led the Eagles to unforeseen heights ahead of schedule. Who won the town over in the winds of a pretty magical season. Who dazzled them early on with visions of Super Bowls and trophies and parades down Broad Street. His name was Donovan McNabb. McNabb's legacy is so loaded, the totality of what he achieved -- and more crucially, failed to -- so all-consuming, that there are no trees, only forest. Why reminisce on his breakout second season, which saw him lead the 2000 Eagles to an unexpected playoff berth? His encore act was three straight losses in the NFC championship game. Why wax nostalgic on his 2004 Super Bowl run? He came up short and never got back, right? In truth, he's one in a long parade of quarterbacks whose relationships with the city proved complicated at best. Ron Jaworski led the Eagles to their first Super Bowl appearance in 1980 and is an icon in the area now, but he was heckled relentlessly in his day. "I don't remember the exact year, but I think I started off against the Colts," he says. "I completed my first 11 passes. The 12th was incomplete and they booed." Cunningham was electric, but he won one playoff game in 11 years. Even Jeff Garcia, who wished the city a Merry Christmas after downing Dallas and became a folk hero for a spell, wasn't in town long enough to engender either disillusionment or idolatry. Among them, though, McNabb stands out as a singular lightning rod. He has been since the day in 1999 when Paul Tagliabue walked up to the mic and said, "With the second pick, the Philadelphia Eagles select Donovan McNabb, quarterback, Syracuse University." Before Tagliabue had even finished, a chorus of boos -- vociferous, arm-thrashing boos -- rained down. The Dirty 30, as that band of Eagles fans came to be known, had unknowingly, and permanently, shifted the city's relationship with the man who would become the best quarterback in team history. "I think Donovan took that personally and it bothered him," Jaworski says. "I think it still bothers him." That the Dirty 30 was, in fact, an event orchestrated by a local radio personality, not truly an organic geyser of disgust, didn't prove to be a salve. Neither did the fans' later assertions that they weren't booing McNabb per se; they were booing the act of not picking reigning Heisman winner Ricky Williams. Nor did a slew of personal apologies from the Dirty 30's representatives -- to McNabb, to his parents, to the entire Eagles organization. Not even the quarterback's success -- his 92-49-1 record as an Eagles starter, five NFC title games, one Super Bowl -- could ever quite resolve the reality that Donovan McNabb and Philadelphia never really found peace with each other. "Every time I go back [to Philly], somebody will always mention, 'Hey, you never really liked the fans,'" he says. "And I'm like, 'Why would you think I didn't like the fans?'" There's no easy answer for the dearth of misty gratitude toward McNabb. While Philadelphia has embraced Wentz for his blue-collar persona, it bristled at McNabb and his (understandable) unwillingness to move past those boos. And McNabb hasn't shied away from acknowledging any ugly forces at play. In 2013, when asked if race played a part in how he was perceived in his career, he didn't balk. "It's been a part," he told Philadelphia Magazine. "What percentage, I don't know. Do I care? No. But it's been a part." 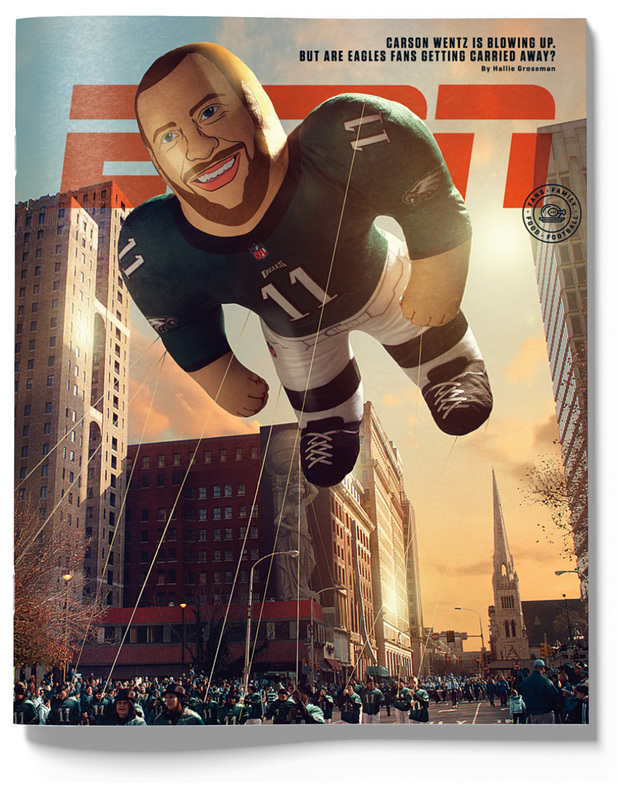 In the end, this seemed an unbreachable clash of personalities -- McNabb, to fans, was thin-skinned and distant; Philadelphians, from his perspective, were demanding and inhospitable. Over the years, though, the frustration between McNabb and Eagles fans seems to have given way to mutual apathy. Outside Lincoln Financial Field before the Denver game in Week 9, there is a steady dose of nostalgia. Brian Dawkins jerseys abound. Reggie White. Harold Carmichael. There's just precious little McNabb-fueled wistfulness. Fans applaud him when he returns. They thank him for the wins and, yes, the memories. But they don't long for him, despite the clear gulf between his time at quarterback and his successors'. "I played for over a decade there and my winning percentage speaks for itself," McNabb says. "And then after I left, they thought Kevin Kolb was going to be the guy. Michael Vick went through his deal. Nick Foles. It was quarterback after quarterback after quarterback, but they weren't able to duplicate the things that we were doing consistently." It is now Carson Wentz's turn to try to accomplish what McNabb never did. What none of his predecessors was able to do. It is his turn to try to win the Super Bowl, and to become -- and remain -- beloved in Philadelphia. There's a litmus test in Philadelphia that has long served as a wedge or a bridge between players and fans. Are you truly Philadelphian? Dawkins acted like a deranged fan, so the fans revered him. Jaworski came to the region and never really left, which is why he's considered more Philly native than upstate New Yorker. Wentz somehow seems to pass this test despite the fact that there is no quarterback in the NFL more intrinsically tied to his home than Wentz is to North Dakota. DeFilippo was recently poring over film with Wentz and asked him which side of the field he'd work during the play. "A horse apiece," Wentz told him. Either, he meant. The Eagles' right tackle, Lane Johnson, can't get over the Bear Grylls backpack the quarterback carries around the locker room. 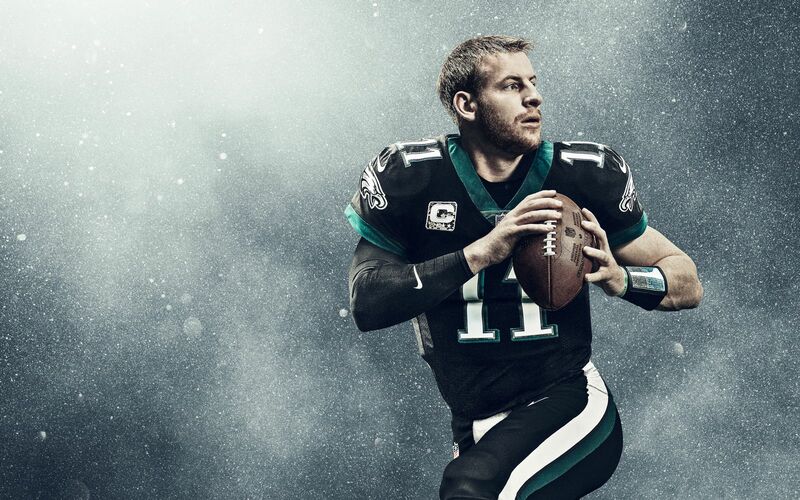 Wentz misses the openness of his home state, so to the extent that he could, he re-created a slice of North Dakota in his new home in New Jersey. "He's out there in the middle of nowhere," Trey Burton says. "He has a ton of land, animals, wildlife. Doesn't have neighbors that are close." Still, the QB spends his bye weeks back in Bismarck, brings his receivers to train with him in the offseason in Fargo. No matter what success he finds in his new home, his old one remains with him. "North Dakota raised me to work hard," he says. "Not getting caught up in everything in life and just being comfortable with who I am -- that's something that I learned growing up." Outside The Linc, in the hours before the Eagles face the Broncos, Preston Thiele strolls among the tailgating masses wearing a green and yellow North Dakota State shirt, "Bison Pride" blazing across his barrel chest. Thiele played football at Wentz's alma mater back in the early 2000s and has flown to Philadelphia to catch the game with his friend Steve, another NDSU football product. They spend the morning fielding thank-yous from Eagles fans grateful to them for the simple act of being North Dakotan. Out in the K Lot, where Stephanie Phillips has been tailgating since 8, she considers how quickly Wentz captured the city. She waves her hand, long nails painted midnight green, punctuating her point. "Faster than anybody I've ..."
"Faster than Donovan," her friend Chuck interjects. "That's for sure." Hours later, as Wentz emerges from a haze of smoke during pregame introductions, a 20-something in Eagles gear climbs the steps of Section 219. He pauses, winds up, then lets loose a guttural howl. With a rout today and another in Week 11 in Dallas, the Eagles rise to 9-1, with Wentz-for-MVP chatter growing louder. This team finds itself the NFC favorite, with championship aspirations. After all, 13 years ago, another Eagles team began its season 9-1 and ended it with a Super Bowl appearance. Philadelphia is on the cusp of believing Wentz can do one better. "Right now?" says Glen Macnow, a longtime Philadelphia transplant and Didinger's radio co-host. "The fans are ..." he pauses, choosing his words carefully, "cautiously hysterical."